Requirements discovery is no longer about producing large, unreadable (and often unread) specifications. Requirements today is about uncovering the real needs of the problem space, understanding the needs of the people who use your solution, the environment for the solution, and then, in a timely manner, delivering requirements that are concise, clear and testable. This workshop — presented by a real business analyst — gives you a thorough and well-established process for uncovering the real requirements, testing them for correctness, and ensuring that all the requirements have been discovered. 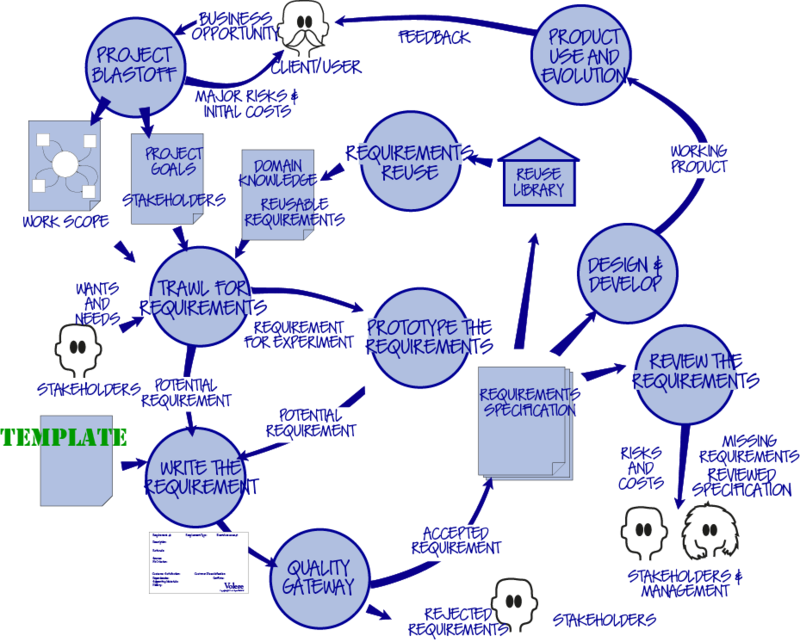 The process is used with variations by both agile and traditional projects. It starts with the business, for it is only within the business that you discover the real needs. When you know the real needs, it becomes possible to determine what will best serve those needs, and to write the requirements or stories to build the right solution. Yes, if you want to be involved in delivering the right systems — the ones that get used. Your title is probably business analyst, systems analyst, product owner, project leader or manager, requirements engineer, consultant, product or program manager or similar. Team members on agile projects benefit from understanding how requirements are best done in agile projects. “The continual use of real examples and experience made it all come to life. The best course I have ever attended. All questions were answered and none dodged”. — Wes Mar, Senior Analyst, Insurance Australia Group. The course begins with an overview of the process. It looks at how agile and traditional projects both need requirements but are done differently, the requirements food chain, and the topics to be covered by the course. Students discuss with the instructor their particular problems and objectives for the course. Requirements are the lynchpin of any development effort, and so must be managed effectively. You are given strategies for your requirements management, the requirements knowledge model, how to prioritise requirements, and how to resolve conflicting requirements. We take a quick look at tools to help manage requirements. You discuss and determine how to make your own requirements process as effective and efficient as possible. This involves incorporating your own organisational processes into the requirements activity. You build a demonstration of how you will use what you have learned when your return to your own workplace. “The course is grounded in the real world of requirements elicitation. It measures excellently.” — John Purssey, ProQual Consulting. We want you to be able to use this right away. Each of the teaching chapters is reinforced with a workshop where you apply the concepts presented in the seminar. You work in a small team to scope the problem space and then discover, specify and evaluate requirements for the solution. The course teaches that requirements come from understanding the business and its internal processes, and how the business interacts with its external customers. The course provides a realistic framework for requirements discovery, not a strict methodology. The framework provides the freedom and encouragement to adapt to your own organisational needs. The techniques are applicable regardless of your development method – agile, traditional, or anything else. 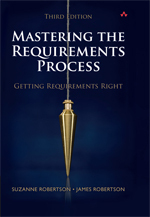 You receive a free copy of Suzanne and James Robertson’s book Mastering the Requirements Process—Third Edition: Getting Requirements Right. This course was written by James Robertson and Suzanne Robertson, creators of the Volere requirements techniques. “Excellent! Great delivery from experienced business analysts (not a “trainer”) with up to date work practices and examples.” — Sandra Pilgrim, CGU Insurance. Suzanne Robertson is co-author of Mastering the Requirements Process, Third Edition: Getting Requirements Right (Addison-Wesley 2012) a book that provides guidance on finding requirements and writing them so that all the stakeholders can understand them. Her other requirements book, Requirements-Led Project Management (Addison-Wesley 2005) addresses how to use requirements as input to planning and management. She is also co-author of the Volere approach to requirements engineering. James Robertson is a consultant, teacher, author, project leader whose area of concern is the requirements for products, and the contribution that good requirements make to successful projects. James is a leading proponent of the principle of introducing creativity into the requirements process. His controversial article “Eureka: Why Analysts Should Invent Requirements” in IEEE Software has provoked heated discussion and has been widely quoted. Before becoming a systems engineer, James trained as an architect and his experience in that profession provides inspiration for his work on innovation and creativity. He is co-author of Mastering the Requirements Process, Third Edition (Addison-Wesley 2012), Requirements-Led Project Management (Addison-Wesley 2005), the Volere approach to requirements engineering, and Complete Systems Analysis: the Workbook, the Textbook, the Answers (Dorset House, 1994), a two-volume text and case study that teaches the craft of systems analysis. It will take three days out of your schedule, and we will give them back to you with interest (think how much extensive modification and abandoned systems cost you). We know that when you use a better requirements process, you will save months of maintenance effort, be more responsive to user requests, and avoid building systems that end up as shelfware.